The endowed chair program was announced in the midst of the campus's first comprehensive fundraising effort, The Campaign for UC Santa Cruz. The campus has raised $215 million toward its $300 million goal. In the space of a year, the number of endowed chairs at UC Santa Cruz has jumped by 30 percent. 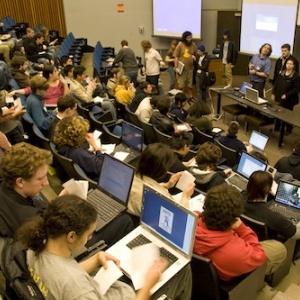 The boost in resources for faculty research comes as UC Santa Cruz supporters seized the opportunity to establish chairs using matching funds committed by UC President Janet Napolitano. Each campus was allocated $4 million to use as an incentive to encourage donors to establish endowed faculty chairs. The funding is from the Presidential Endowment Fund, a source of private donations that the president may use at her discretion to support university activities. Each President’s Match is $500,000. Campuses were required to raise at least $500,000 per chair in donor funds to qualify for the match. “The matching funds provided a catalyst for conversations with prospective donors who were interested in supporting faculty and graduate students,” Associate Vice Chancellor for Philanthropy Jeff Shilling said. The endowed chair program was announced in the midst of the campus’s first comprehensive fundraising effort, The Campaign for UC Santa Cruz. The campus has raised $215 million toward its $300 million goal. Napolitano has said she will allocate another $10 million in matching funds in subject areas that she considers to be of high strategic importance to California and the world. In making those allocations, Napolitano said she would also consider campus need and the ability to attract a match. Shilling said he looks forward to receiving more details about future matching funds as donors seem to be especially drawn to opportunities where their gifts will be leveraged. Endowed chairs are vital to UC’s efforts to attract and retain top-flight faculty, Napolitano told the regents. Once established, endowed chairs provide a dedicated source of funds, in perpetuity, for the chair holder’s scholarly activities as well as support for faculty salaries and graduate fellowships. That kind of guaranteed support gives UC a competitive edge for recruiting faculty who are the very best in their field. And it helps the university bridge funding gaps in state support, she said.